Sometimes hostas that looked just fine in the fall come up much smaller or not at all the next spring. Digging them we find that the rhizome and roots are rotting. 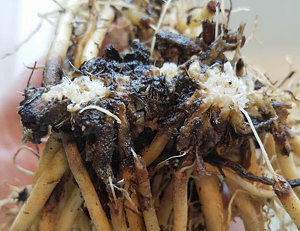 While the crown and roots are rotting, it isn't caused by any disease. Some combination of winter temperatures and moisture damaged the plant and killed part or all of it while it was dormant. Since we can't even tell when it happened we'll probably never really know what did it. As the soil warms fungi and bacteria become active and start the decomposition process. Since it's dead there's no reason to try to stop the rot. After all, dead is dead and it won't become a zombie hosta. Small pieces that survive can be grown on. In the Garden: Little can be done about plants in the ground. For overwintering potted plants, seek advice from local hosta nurseries that overwinter lots of pots.